The story is taking place in a magic forest. Little Red Riding Hood is three years older since her adventure with the big bad wolf. She is picking flowers again when she has an unexpected meeting with an old woman who needs help with her nails. Red Riding Hood offers to help but has to go back home to get a pair of scissors and liquid soap. On her way back Red Riding Hood comes face to face with a big bad wolf. Perhaps he is the brother of the one who almost devoured Little Red Riding Hood and her grandmother. Although Red Riding Hood is fearless, she unwittingly reveals to the wolf where the old woman’s hut is. Poor wolf! He believes that the old woman is an easy prey. But instead of the old woman the wolf finds a ewe in the hut. “All the better”, he thinks to himself. But the ewe is not daunted by the threats of the wolf. Actually, the wolf is frustrated by the ewe who threatens him with “If you eat me, the woodcutter will be very angry. 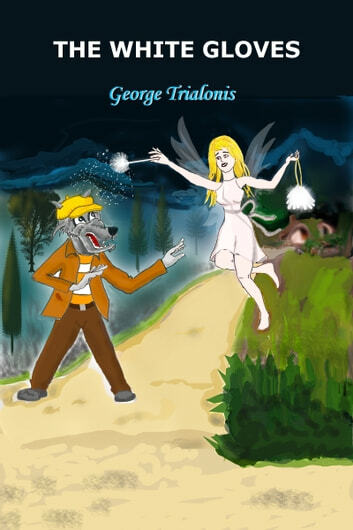 He will find you, catch you, tie you up, put you in a cage and release you in the big city.” The wolf is so frustrated by his failed attempts to eat the ewe that he runs to the village to buy a lot of presents for Riding Hood. When the wolf returns to the hut to eat the ewe, he finds the ewe knitting a pair of white gloves from her own wool. The wolf is delighted and at the same time determined to eat her. But he needs to know why the ewe threatened him with the woodcutter releasing him in the big city. She invites the wolf to sit next to her on a couch and watch a documentary about the bit city. But this documentary makes the wolf abandon his plans to eat the ewe and to want to go to the big city which for him looks like a “goldmine” or a “meatmine”. When the wolf leaves, the ewe takes her real form. She is a fairy. But she has to leave the magic forest and go to the big city, too. The big bad wolf and the fairy meet again, this time in the big city. Oh, this is an exciting meeting, beyond imagination and with an unexpected ending. A Book of Children’s Poems By Noah’s Anna (Great Gramma): The World Through the Eyes of a Child.